don't know they don't do what they're meant to. and analyzed using techniques that exaggerate the benefits. Reboxetine is a drug I have prescribed. Other drugs had done nothing for my patient, so we wanted to try something new. I'd read the trial data before I wrote the prescription, and found only well-designed, fair tests, with overwhelmingly positive results. Reboxetine was better than a placebo, and as good as any other antidepressant in head-to-head comparisons. It's approved for use by the Medicines and Healthcare products Regulatory Agency (the MHRA), which governs all drugs in the UK. Millions of doses are prescribed every year, around the world. Reboxetine was clearly a safe and effective treatment. The patient and I discussed the evidence briefly, and agreed it was the right treatment to try next. But we had both been misled. In October 2010, a group of researchers was finally able to bring together all the data that had ever been collected on reboxetine, both from trials that were published and from those that had never appeared in academic papers. When all this trial data was put together, it produced a shocking picture. Seven trials had been conducted comparing reboxetine against a placebo. Only one, conducted in 254 patients, had a neat, positive result, and that one was published in an academic journal, for doctors and researchers to read. But six more trials were conducted, in almost 10 times as many patients. All of them showed that reboxetine was no better than a dummy sugar pill. None of these trials was published. I had no idea they existed. It got worse. The trials comparing reboxetine against other drugs showed exactly the same picture: three small studies, 507 patients in total, showed that reboxetine was just as good as any other drug. They were all published. But 1,657 patients' worth of data was left unpublished, and this unpublished data showed that patients on reboxetine did worse than those on other drugs. If all this wasn't bad enough, there was also the side-effects data. The drug looked fine in the trials that appeared in the academic literature; but when we saw the unpublished studies, it turned out that patients were more likely to have side-effects, more likely to drop out of taking the drug and more likely to withdraw from the trial because of side-effects, if they were taking reboxetine rather than one of its competitors. I did everything a doctor is supposed to do. I read all the papers, I critically appraised them, I understood them, I discussed them with the patient and we made a decision together, based on the evidence. In the published data, reboxetine was a safe and effective drug. In reality, it was no better than a sugar pill and, worse, it does more harm than good. As a doctor, I did something that, on the balance of all the evidence, harmed my patient, simply because unflattering data was left unpublished. Nobody broke any law in that situation, reboxetine is still on the market and the system that allowed all this to happen is still in play, for all drugs, in all countries in the world. Negative data goes missing, for all treatments, in all areas of science. The regulators and professional bodies we would reasonably expect to stamp out such practices have failed us. These problems have been protected from public scrutiny because they're too complex to capture in a soundbite. This is why they've gone unfixed by politicians, at least to some extent; but it's also why it takes detail to explain. The people you should have been able to trust to fix these problems have failed you, and because you have to understand a problem properly in order to fix it, there are some things you need to know. Unsurprisingly, these trials tend to produce results that favor the manufacturer. When trials throw up results that companies don't like, they are perfectly entitled to hide them from doctors and patients, so we only ever see a distorted picture of any drug's true effects. Regulators see most of the trial data, but only from early on in a drug's life, and even then they don't give this data to doctors or patients, or even to other parts of government. This distorted evidence is then communicated and applied in a distorted fashion. In their 40 years of practice after leaving medical school, doctors hear about what works ad hoc, from sales reps, colleagues and journals. But those colleagues can be in the pay of drug companies - often undisclosed - and the journals are, too. And so are the patient groups. And finally, academic papers, which everyone thinks of as objective, are often covertly planned and written by people who work directly for the companies, without disclosure. Sometimes whole academic journals are owned outright by one drug company. Aside from all this, for several of the most important and enduring problems in medicine, we have no idea what the best treatment is, because it's not in anyone's financial interest to conduct any trials at all. In 2010, researchers from Harvard and Toronto found all the trials looking at five major classes of drug - antidepressants, ulcer drugs and so on - then measured two key features: were they positive, and were they funded by industry? They found more than 500 trials in total: 85% of the industry-funded studies were positive, but only 50% of the government-funded trials were. In 2007, researchers looked at every published trial that set out to explore the benefits of a statin. These cholesterol-lowering drugs reduce your risk of having a heart attack and are prescribed in very large quantities. This study found 192 trials in total, either comparing one statin against another, or comparing a statin against a different kind of treatment. They found that industry-funded trials were 20 times more likely to give results favoring the test drug. These are frightening results, but they come from individual studies. So let's consider systematic reviews into this area. In 2003, two were published. They took all the studies ever published that looked at whether industry funding is associated with pro-industry results, and both found that industry-funded trials were, overall, about four times more likely to report positive results. A further review in 2007 looked at the new studies in the intervening four years: it found 20 more pieces of work, and all but two showed that industry-sponsored trials were more likely to report flattering results. It turns out that this pattern persists even when you move away from published academic papers and look instead at trial reports from academic conferences. James Fries and Eswar Krishnan, at the Stanford University School of Medicine in California, studied all the research abstracts presented at the 2001 American College of Rheumatology meetings which reported any kind of trial and acknowledged industry sponsorship, in order to find out what proportion had results that favored the sponsor's drug. In general, the results section of an academic paper is extensive: the raw numbers are given for each outcome, and for each possible causal factor, but not just as raw figures. The "ranges" are given, subgroups are explored, statistical tests conducted, and each detail is described in table form, and in shorter narrative form in the text. This lengthy process is usually spread over several pages. In Fries and Krishnan (2004), this level of detail was unnecessary. "The results from every randomized controlled trial (45 out of 45) favored the drug of the sponsor." How does this happen? How do industry-sponsored trials almost always manage to get a positive result? Sometimes trials are flawed by design. You can compare your new drug with something you know to be rubbish - an existing drug at an inadequate dose, perhaps, or a placebo sugar pill that does almost nothing. You can choose your patients very carefully, so they are more likely to get better on your treatment. You can peek at the results halfway through, and stop your trial early if they look good. But after all these methodological quirks comes one very simple insult to the integrity of the data. Sometimes, drug companies conduct lots of trials, and when they see that the results are unflattering, they simply fail to publish them. Because researchers are free to bury any result they please, patients are exposed to harm on a staggering scale throughout the whole of medicine. Doctors can have no idea about the true effects of the treatments they give. Does this drug really work best, or have I simply been deprived of half the data? No one can tell. Is this expensive drug worth the money, or has the data simply been massaged? No one can tell. Will this drug kill patients? Is there any evidence that it's dangerous? No one can tell. This is a bizarre situation to arise in medicine, a discipline in which everything is supposed to be based on evidence. And this data is withheld from everyone in medicine, from top to bottom. Nice, for example, is the National Institute for Health and Clinical Excellence, created by the British government to conduct careful, unbiased summaries of all the evidence on new treatments. 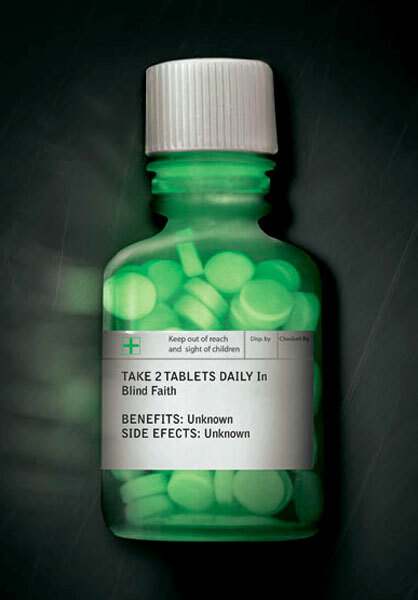 It is unable either to identify or to access data on a drug's effectiveness that's been withheld by researchers or companies: Nice has no more legal right to that data than you or I do, even though it is making decisions about effectiveness, and cost-effectiveness, on behalf of the NHS, for millions of people. In any sensible world, when researchers are conducting trials on a new tablet for a drug company, for example, we'd expect universal contracts, making it clear that all researchers are obliged to publish their results, and that industry sponsors - which have a huge interest in positive results - must have no control over the data. But, despite everything we know about industry-funded research being systematically biased, this does not happen. In fact, the opposite is true: it is entirely normal for researchers and academics conducting industry-funded trials to sign contracts subjecting them to gagging clauses that forbid them to publish, discuss or analyse data from their trials without the permission of the funder. This is such a secretive and shameful situation that even trying to document it in public can be a fraught business. In 2006, a paper was published in the Journal of the American Medical Association (Jama), one of the biggest medical journals in the world, describing how common it was for researchers doing industry-funded trials to have these kinds of constraints placed on their right to publish the results. These trials were overwhelmingly sponsored by the pharmaceutical industry (98%) and the rules governing the management of the results tell a story that walks the now familiar line between frightening and absurd. For 16 of the 44 trials, the sponsoring company got to see the data as it accumulated, and in a further 16 it had the right to stop the trial at any time, for any reason. This means that a company can see if a trial is going against it, and can interfere as it progresses, distorting the results. Even if the study was allowed to finish, the data could still be suppressed: there were constraints on publication rights in 40 of the 44 trials, and in half of them the contracts specifically stated that the sponsor either owned the data outright (what about the patients, you might say? ), or needed to approve the final publication, or both. None of these restrictions was mentioned in any of the published papers. "both shaken and enraged about the criticism, that could not be recognized". It demanded an investigation of the scientists, though it failed to say by whom or of what. Lif then wrote to the Danish Committee on Scientific Dishonesty, accusing the Cochrane researchers of scientific misconduct. We can't see the letter, but the researchers say the allegations were extremely serious - they were accused of deliberately distorting the data - but vague, and without documents or evidence to back them up. Nonetheless, the investigation went on for a year. Peter Gøtzsche, director of the Cochrane Centre, told the British Medical Journal that only Lif's third letter, 10 months into this process, made specific allegations that could be investigated by the committee. Two months after that, the charges were dismissed. The Cochrane researchers had done nothing wrong. But before they were cleared, Lif copied the letters alleging scientific dishonesty to the hospital where four of them worked, and to the management organization running that hospital, and sent similar letters to the Danish medical association, the ministry of health, the ministry of science and so on. Gøtzsche and his colleagues felt "intimidated and harassed" by Lif's behavior. Lif continued to insist that the researchers were guilty of misconduct even after the investigation was completed. Paroxetine is a commonly used antidepressant, from the class of drugs known as selective serotonin reuptake inhibitors or SSRIs. It's also a good example of how companies have exploited our long-standing permissiveness about missing trials, and found loopholes in our inadequate regulations on trial disclosure. To understand why, we first need to go through a quirk of the licensing process. Drugs do not simply come on to the market for use in all medical conditions: for any specific use of any drug, in any specific disease, you need a separate marketing authorization. So a drug might be licensed to treat ovarian cancer, for example, but not breast cancer. That doesn't mean the drug doesn't work in breast cancer. There might well be some evidence that it's great for treating that disease, too, but maybe the company hasn't gone to the trouble and expense of getting a formal marketing authorization for that specific use. Doctors can still go ahead and prescribe it for breast cancer, if they want, because the drug is available for prescription, it probably works, and there are boxes of it sitting in pharmacies waiting to go out. In this situation, the doctor will be prescribing the drug legally, but "off-label". Now, it turns out that the use of a drug in children is treated as a separate marketing authorization from its use in adults. This makes sense in many cases, because children can respond to drugs in very different ways and so research needs to be done in children separately. But getting a licence for a specific use is an arduous business, requiring lots of paperwork and some specific studies. Often, this will be so expensive that companies will not bother to get a licence specifically to market a drug for use in children, because that market is usually much smaller. So it is not unusual for a drug to be licensed for use in adults but then prescribed for children. Regulators have recognized that this is a problem, so recently they have started to offer incentives for companies to conduct more research and formally seek these licences. When GlaxoSmithKline applied for a marketing authorization in children for paroxetine, an extraordinary situation came to light, triggering the longest investigation in the history of UK drugs regulation. Between 1994 and 2002, GSK conducted nine trials of paroxetine in children. The first two failed to show any benefit, but the company made no attempt to inform anyone of this by changing the "drug label" that is sent to all doctors and patients. "It would be commercially unacceptable to include a statement that efficacy had not been demonstrated, as this would undermine the profile of paroxetine." so, while the company knew the drug didn't work in children, it was in no hurry to tell doctors that, despite knowing that large numbers of children were taking it. More trials were conducted over the coming years - nine in total - and none showed that the drug was effective at treating depression in children. It gets much worse than that. These children weren't simply receiving a drug that the company knew to be ineffective for them; they were also being exposed to side-effects. This should be self-evident, since any effective treatment will have some side-effects, and doctors factor this in, alongside the benefits (which in this case were nonexistent). But nobody knew how bad these side-effects were, because the company didn't tell doctors, or patients, or even the regulator about the worrying safety data from its trials. This was because of a loophole: you have to tell the regulator only about side-effects reported in studies looking at the specific uses for which the drug has a marketing authorization. Because the use of paroxetine in children was "off-label", GSK had no legal obligation to tell anyone about what it had found. People had worried for a long time that paroxetine might increase the risk of suicide, though that is quite a difficult side-effect to detect in an antidepressant. In February 2003, GSK spontaneously sent the MHRA a package of information on the risk of suicide on paroxetine, containing some analyses done in 2002 from adverse-event data in trials the company had held, going back a decade. This analysis showed that there was no increased risk of suicide. But it was misleading: although it was unclear at the time, data from trials in children had been mixed in with data from trials in adults, which had vastly greater numbers of participants. As a result, any sign of increased suicide risk among children on paroxetine had been completely diluted away. Later in 2003, GSK had a meeting with the MHRA to discuss another issue involving paroxetine. At the end of this meeting, the GSK representatives gave out a briefing document, explaining that the company was planning to apply later that year for a specific marketing authorization to use paroxetine in children. They mentioned, while handing out the document, that the MHRA might wish to bear in mind a safety concern the company had noted: an increased risk of suicide among children with depression who received paroxetine, compared with those on dummy placebo pills. This was vitally important side-effect data, being presented, after an astonishing delay, casually, through an entirely inappropriate and unofficial channel. Although the data was given to completely the wrong team, the MHRA staff present at this meeting had the wit to spot that this was an important new problem. A flurry of activity followed: analyses were done, and within one month a letter was sent to all doctors advising them not to prescribe paroxetine to patients under the age of 18. How is it possible that our systems for getting data from companies are so poor, they can simply withhold vitally important information showing that a drug is not only ineffective, but actively dangerous? Because the regulations contain ridiculous loopholes, and it's dismal to see how GSK cheerfully exploited them: when the investigation was published in 2008, it concluded that what the company had done - withholding important data about safety and effectiveness that doctors and patients clearly needed to see - was plainly unethical, and put children around the world at risk; but our laws are so weak that GSK could not be charged with any crime. After this episode, the MHRA and EU changed some of their regulations, though not adequately. They created an obligation for companies to hand over safety data for uses of a drug outside its marketing authorization; but ridiculously, for example, trials conducted outside the EU were still exempt. we already know that if we see only a biased sample of the data, we are misled. safety signals are often weak, subtle and difficult to detect. In the case of paroxetine, the dangers became apparent only when the adverse events from all of the trials were pooled and analyzed together. That leads us to the second obvious flaw in the current system: the results of these trials are given in secret to the regulator, which then sits and quietly makes a decision. This is the opposite of science, which is reliable only because everyone shows their working, explains how they know that something is effective or safe, shares their methods and results, and allows others to decide if they agree with the way in which the data was processed and analyzed. Yet for the safety and efficacy of drugs, we allow it to happen behind closed doors, because drug companies have decided that they want to share their trial results discretely with the regulators. So the most important job in evidence-based medicine is carried out alone and in secret. And regulators are not infallible, as we shall see. Rosiglitazone was first marketed in 1999. In that first year, Dr John Buse from the University of North Carolina discussed an increased risk of heart problems at a pair of academic meetings. The drug's manufacturer, GSK, made direct contact in an attempt to silence him, then moved on to his head of department. Buse felt pressured to sign various legal documents. To cut a long story short, after wading through documents for several months, in 2007 the US Senate committee on finance released a report describing the treatment of Buse as "intimidation". But we are more concerned with the safety and efficacy data. In 2003 the Uppsala drug monitoring group of the World Health Organization contacted GSK about an unusually large number of spontaneous reports associating rosiglitazone with heart problems. GSK conducted two internal meta-analyses of its own data on this, in 2005 and 2006. These showed that the risk was real, but although both GSK and the FDA had these results, neither made any public statement about them, and they were not published until 2008. During this delay, vast numbers of patients were exposed to the drug, but doctors and patients learned about this serious problem only in 2007, when cardiologist Professor Steve Nissen and colleagues published a landmark meta-analysis. This showed a 43% increase in the risk of heart problems in patients on rosiglitazone. Since people with diabetes are already at increased risk of heart problems, and the whole point of treating diabetes is to reduce this risk, that finding was big potatoes. Nissen's findings were confirmed in later work, and in 2010 the drug was either taken off the market or restricted, all around the world. Now, my argument is not that this drug should have been banned sooner because, as perverse as it sounds, doctors do often need inferior drugs for use as a last resort. For example, a patient may develop idiosyncratic side-effects on the most effective pills and be unable to take them any longer. Once this has happened, it may be worth trying a less effective drug if it is at least better than nothing. The concern is that these discussions happened with the data locked behind closed doors, visible only to regulators. In fact, Nissen's analysis could only be done at all because of a very unusual court judgment. In 2004, when GSK was caught out withholding data showing evidence of serious side-effects from paroxetine in children, their bad behavior resulted in a US court case over allegations of fraud, the settlement of which, alongside a significant payout, required GSK to commit to posting clinical trial results on a public website. Nissen used the rosiglitazone data, when it became available, and found worrying signs of harm, which they then published to doctors - something the regulators had never done, despite having the information years earlier. If this information had all been freely available from the start, regulators might have felt a little more anxious about their decisions but, crucially, doctors and patients could have disagreed with them and made informed choices. This is why we need wider access to all trial reports, for all medicines. Missing data poisons the well for everybody. If proper trials are never done, if trials with negative results are withheld, then we simply cannot know the true effects of the treatments we use. Evidence in medicine is not an abstract academic preoccupation. When we are fed bad data, we make the wrong decisions, inflicting unnecessary pain and suffering, and death, on people just like us.